The global airway management devices market was valued at around US$ 800.0 Mn in 2017. It is projected to expand at a compounded annual growth rate (CAGR) of more than 4.0% from 2018 to 2026, according to a new report published by Transparency Market Research (TMR) titled “Airway Management Devices Market – Global Industry Analysis, Size, Share, Growth, Trends, and Forecast, 2018–2026”. The report suggests that factors such as rise in adoption of airway management devices, increase in patient pool, rise in geriatric population, and surge in prevalence of respiratory disorders, such as chronic obstructive pulmonary disorder (COPD), asthma, and newborn infections, are likely to boost the demand for airway management devices in the next few years. Advancements in technology and rise in demand for airway management devices among the geriatric and neonatal populations are expected to boost the market in North America and Europe during the forecast period. These regions are likely to account for a significant share of the global airway management devices market during the forecast period. In Asia Pacific, increase in government support, primarily due to improving health care infrastructure, rising disposable income, and technological advancements in countries such as China and India are projected to drive the market from 2018 to 2026. The supraglottic device segment is expected to account for a leading share of the market by the end of 2026. Rapid rise in the geriatric population, increase in incidence of chronic obstructive pulmonary disease and other respiratory emergencies, and technological innovations in respiratory care devices leading to advantages, such as quick and easy to use, and lower drug costs are major factors that are expected to drive the segment during the forecast period. In terms of end-user, the OR segment is expected to hold a prominent share of 45.5% of the global airway management devices market share by 2026. This can be attributed to the ready availability of facilities and devices in operating rooms and high number of anesthesia procedures carried out in operating rooms, as these centers are specially designed to perform all major and minor surgical procedures where airway management is required. Based on geography, the global airway management devices market has been divided into major five regions: North America, Europe, Asia Pacific, Latin America, and Middle East & Africa. 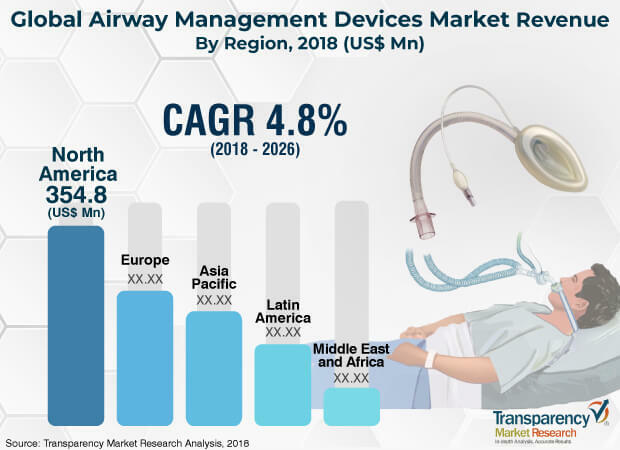 The airway management devices market in Asia Pacific is projected to expand rapidly at a CAGR of around 5.0% during the forecast period due to increasing health care expenditure, adoption of new technologies, and increased patient pool in the region. Prominent players operating in the global airway management devices market are Teleflex Incorporated, VYAIRE, GE Healthcare, Medtronic plc, Koninklijke Philips N.V., Ambu A/S, Smiths Medical, Olympus Corporation, Karl Storz Gmbh & Co. KG, and Medline Industries, Inc. These companies are investing vigorously in mergers and acquisitions and research and development in order to expand their reach and increase their revenue. They are projected to maintain their leading position in the global airway management devices market during the forecast period.